Ever since my trip to Mexico City I have dreamt of the amazing food I ate there. It was Mexican, but not as we know it. Authentic flavours, intriguing ingredients, colourful and utterly delicious. There was a reason that so many Mexican restaurants featured in the Latin America’s 50 Best Restaurants list, which was the awards ceremony I flew to Mexico for in 2016, and it was because the food was absolutely incredible. When I heard that Michelin starred Chef Martha Ortiz had opened a restaurant in London, I was super excited that my friends and family could finally get a flavour of what I experienced in Mexico, and also that I could finally indulge in all that amazing food again. What was even better was that her London restaurant, named Ella Canta, was located at one of my favourite hotels – The InterContinental, Park Lane. We were booked in for the Sunday brunch and so decided to skip breakfast in anticipation of our meal. The restaurant was large and spacious, with classy design and had a fantastic buzz. The perfect place to celebrate a special occasion or have a catch up with friends. The menu was split into Overture (Starters), Main Act (Mains) and Final Curtain (Desserts), and for a brunch was a very impressive and generous selection! We kicked off with cocktails, and I chose one of the signature Margaritas – the Coa de Jima, which was described as Sweet, exotic and elegant on the menu. This was a mix of Patron Reposado Tequila, Huana Guanabana Rum liqueur, homemade spiced pineapple puree, aloe vera, vanilla syrup, lime, passion fruit and champagne foam. A fun fact on the menu was that El Jimador, an agave farmer, never separates from his Coa de Jima as it gives him rewards in abundance. Amit chose the Cuatro Milpas, which was described as Citrusy, light and melodic. A blend of Hacienda de Chihuhua Sotol Plata, Nardini Acqua di Cedro liqueur, rhubarb syrup, Seedlip Spice, mandarin juice, mint and Dandelion Burdock bitters. The fun fact under this cocktail was that a Mexican folk song longs for love of Chihuahua in northern Mexico – the land that inspired Sotol made from agave. How the menu worked was that you get all the dishes listed under the Overture and then you chose a main dish from the Main Act section. 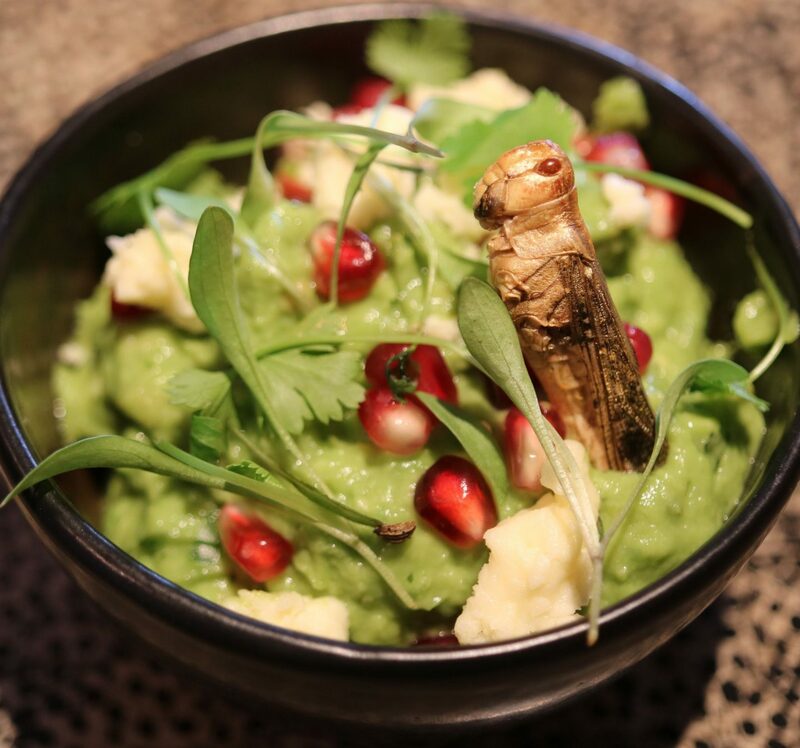 We had a generous and amazing selection to indulge in which included the best Guacamole I have had in London – The Guacamole Nacionalista con las joyas Mexicanas which is guacamole served with ricotta cheese, pomegranate and garnished with a gold grasshopper. The grasshopper is not real so don’t stress! The colours resembled the Mexican flag and it was sublime. Next up and beautifully presented was the Ceviche de almeja navaja, fruta de la pasión, and habanero y mango and the Ostiones con raspado tomatillo, which were a Razor clam ceviche with passion fruit, mango and habanero and Oysters with a tomatillo granite. My favourite out of the two were the Razor clams as it had such a zesty tropical taste to it, but the Oysters were really good too. Sope, quail eggs and black beans. Oaxaca cheese & poblano, wild mushrooms & cheese, beef machaca & chihuahua cheese, and huitlacoche & chihuahua cheese. These were incredible and a must order! The starter selection had been amazing and so we were really looking forward to our mains. We switched to wine for our mains and I just adored the glasses! So classy! Lobster tacos served with black beans and chorizo. Both our mains were absolutely wonderful and full of flavour, and they were served with sides of Nopal salad and grilled cabbage. The tacos were authentic and just amazing and I was so pleased with the culinary journey this meal was taking us on. Now the final act – a platter which had the dreamiest dessert combination of Fantásticos churros Mexicanos con festín de caramelo y chocolate, which were Mexican churros, caramel and a hocolate feast, Pastel tres leches, which were a cake made from three different milk bases, and Selección de nieves y helados Mexicanos, which were Mexican inspired ice creams and sorbets. All three were stunning but my favourites were the churros as they were divine! Especially with the selection of dips. I loved that we could try three different desserts as part of the brunch menu. The entire meal was delicious, the service was fantastic and we left already thinking we would book soon to come back for dinner. This was Amit’s first experience of innovative Mexican cuisine and he absolutely enjoyed it all, especially the vibrant colours and mesmerising flavours. It is a must try for Mexican food which is a delight to the senses and makes for a very unusual but epic brunch! I could definitely vouch that it is every bit as amazing as her restaurant in Mexico City, but with a London touch! For more information and menus visit their website. Disclaimer: My brunch was complimentary but all views and photos are my own. Looks fantastic, I love the look of the quesadilla multicolor and of course the churros! I love Mexican food although I’ve never quite found a super mind-blowing restaurant here in London. The razor clams and oysters sound right up my alley – and I totes freaked out with the grasshopper! I’ve heard good things about this restaurant so great to see it’s living up to them! Those wine glasses are incredible! Although I don’t think I could have them at home, I’m such a clumsy creature I’d be bound to break one instantly.